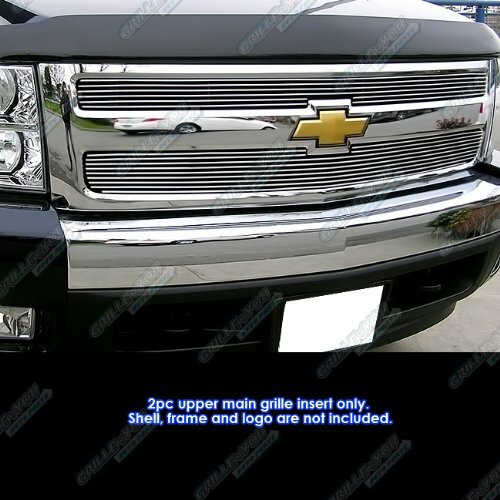 Fitment*2007-2013 Chevy Silverado 1500 NOT for 07 Classic ModelPackage ContentThis item includes Bolt Over/Overlay/Bolton Chrome Main Upper Grille Grill Inserts with Polished surface finish, mounting hardwares and installation paper.IntroductionAluminum Horizontal Billet Grille Inserts are recognized as APS most classic grill products. 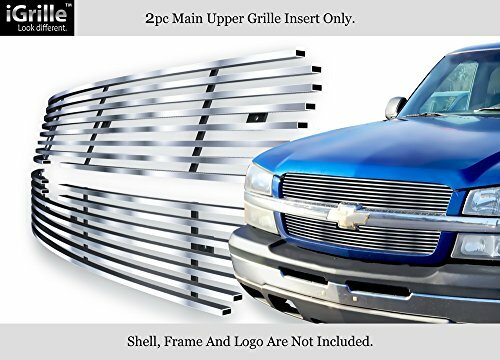 This custom grille insert is easy to install and will upgrade your car or truck's appearance immediately.These grilles are manufactured in an ISO-9001 certified factory. Every month we have over 20 new grilles released in the market. 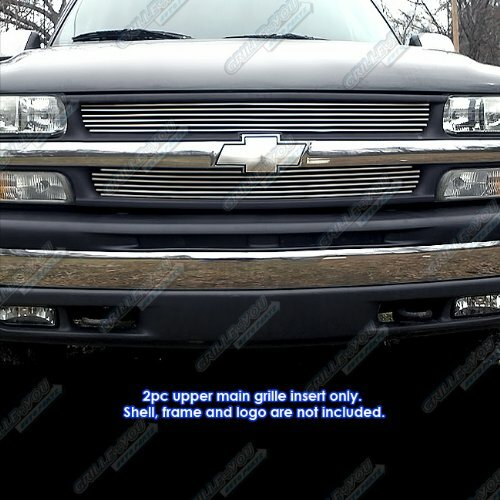 Fitment*2006 Chevy Silverado 1500/1500HD *2005-2006 Chevy Silverado 2500HD/3500*2007 Chevy Silverado Classic 1500/2500HD/3500Package ContentThis item includes Bolt Over/Overlay/Bolton Chrome Main Upper Grille Grill Inserts with Polished surface finish, mounting hardwares and installation paper.IntroductionAluminum Horizontal Billet Grille Inserts are recognized as APS most classic grill products. This custom grille insert is easy to install and will upgrade your car or truck's appearance immediately.These grilles are manufactured in an ISO-9001 certified factory. Every month we have over 20 new grilles released in the market. 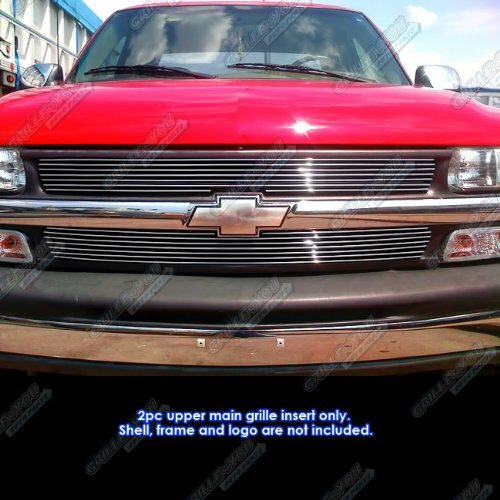 Fitment*1999-2002 Chevy Silverado 1500 * 2000-2006 Chevy Suburban * 2000-2006 Chevy TahoePackage ContentThis item includes Replacement(Cutting Required) Chrome Main Upper Grille Grill Inserts with Polished surface finish, mounting hardwares and installation paper.IntroductionAluminum Horizontal Billet Grille Inserts are recognized as APS most classic grill products. 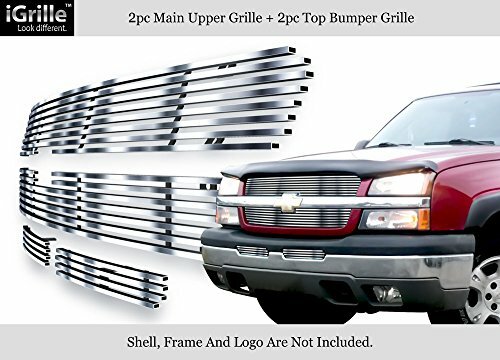 This custom grille insert is easy to install and will upgrade your car or truck's appearance immediately.These grilles are manufactured in an ISO-9001 certified factory. Every month we have over 20 new grilles released in the market. 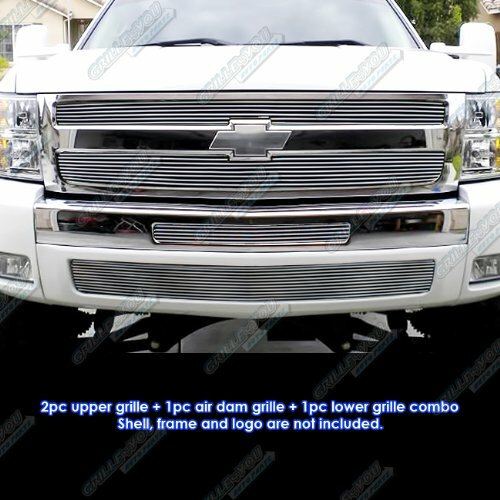 Fitment*2007-2013 Chevy Silverado 1500Package ContentThis item includes 2 pcs Bolt Over/Overlay/Bolton (Drilling Not Required) Horizontal Billet Grill Insert with Hairlines surface finish, along with mounting hardware and installation manual. Please note the material is Stainless Steel and color is Silver.IntroductionWhat is iGrille? The iGrille is new generation stainless steel grille insert that was made to be different. Only the iGrille has 3D shine. And it comes with silver, chrome and black color. Each bar on this grille is brushed or powder-coated on all 4 sides; unlike an aluminum grille which only has 1 finished surface. Made of grade 304 stainless steel, the iGrille far surpasses aluminum grilles for protection against oxidation and corrosion. The iGrille will stay brushed and shiny looking whereas an aluminum grille may look tarnished and lackluster with time. Size matters! The iGrille is wider and heavier than an aluminum grille for the same application. At a hefty 6mm in width, the iGrille is 50% wider. Choose the iGrille for a grille that truly stands out on your vehicle! Fitment2007-2012 Chevy Silverado 1500Package ContentThis item includes Bolt Over Style (Drilling may require) Chrome Main Upper + Lower Bumper Grille Grill Inserts with Polished surface finish, mounting hardwares and installation paper.IntroductionAluminum Horizontal Billet Grille Inserts are recognized as APS most classic grill products. 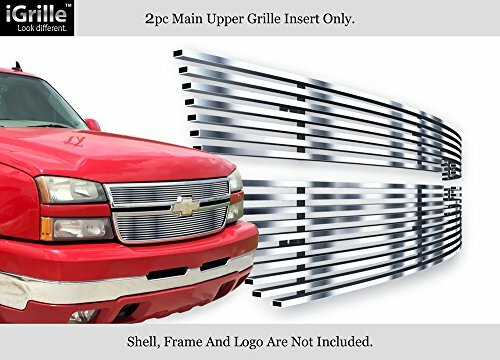 This custom grille insert is easy to install and will upgrade your car or truck's appearance immediately.These grilles are manufactured in an ISO-9001 certified factory. Every month we have over 20 new grilles released in the market. 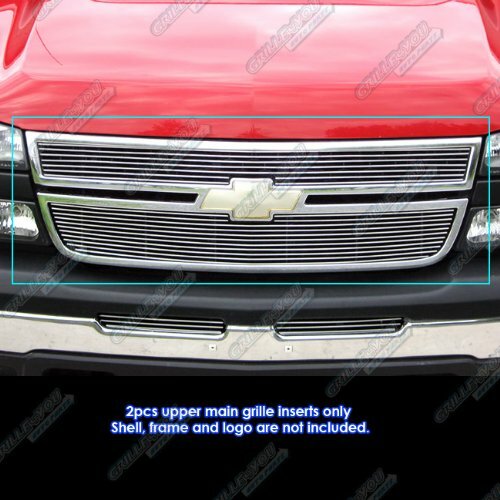 Fitment2003-2005 Chevy Silverado 1500/1500HD *2003-2004 Chevy Silverado 2500/3500/2500HDPackage ContentThis item includes 2pc Main Upper grille(Bolton) and 2pc Air dam grille(Replacement,Cutting Not Required) Bolt Over Style or Replacement (Drilling may require) Horizontal Billet Grill Insert with Hairlines surface finish, along with mounting hardware and installation manual. Please note the material is Stainless Steel and color is Silver.IntroductionWhat is iGrille? The iGrille is new generation stainless steel grille insert that was made to be different. Only the iGrille has 3D shine. And it comes with silver, chrome and black color. Each bar on this grille is brushed or powder-coated on all 4 sides; unlike an aluminum grille which only has 1 finished surface. Made of grade 304 stainless steel, the iGrille far surpasses aluminum grilles for protection against oxidation and corrosion. The iGrille will stay brushed and shiny looking whereas an aluminum grille may look tarnished and lackluster with time. Size matters! The iGrille is wider and heavier than an aluminum grille for the same application. At a hefty 6mm in width, the iGrille is 50% wider. Choose the iGrille for a grille that truly stands out on your vehicle! Fitment*1999-2002 Chevy Silverado 1500/1500HD * 2000-2006 Chevy Suburban * 2000-2006 Chevy Tahoe * 1999-2000 Chevy Silverado 2500/2500HD/3500Package ContentThis item includes Bolt Over/Overlay/Bolton (Drilling Required) Chrome Main Upper Grille Grill Inserts with Polished surface finish, mounting hardwares and installation paper.IntroductionAluminum Horizontal Billet Grille Inserts are recognized as APS most classic grill products. 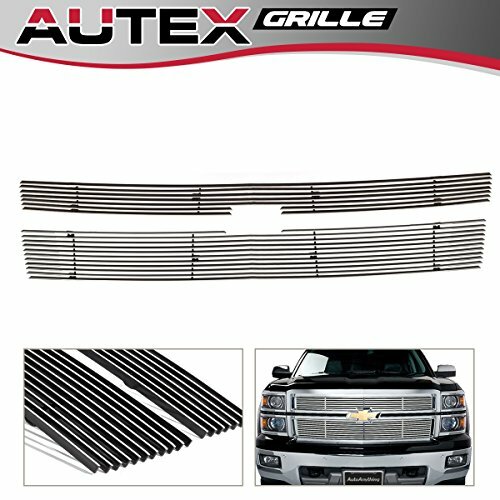 This custom grille insert is easy to install and will upgrade your car or truck's appearance immediately.These grilles are manufactured in an ISO-9001 certified factory. Every month we have over 20 new grilles released in the market. This video shows the beginer or novice mechanic just how fast and simple it is to install a billet grill on a Chevy Silverado. Step by step insructions with before and after pics. Jarode and I install a Billet Grille on a 2003 GMC SIERRA. I don't know if it is a polished aluminum grille or a chromed steel but it sure is nice and shinny. Pretty sure it's chrome. 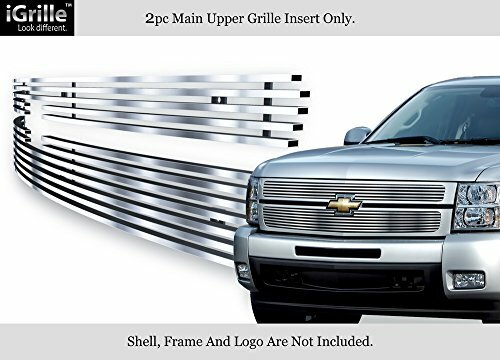 Compare prices on Silverado Billet Grill at TopShopion.com – use promo codes and coupons for best offers and deals. We work hard to get you amazing deals and collect all avail hot offers online and represent it in one place for the customers. Now our visitors can leverage benefits of big brands and heavy discounts available for that day and for famous brands.